We have burst into bloom here. And with the resulting pollen and nectar flow, our honeybees have been requiring a good deal of attention. We have many old heritage apple and crabapple trees here, some out in the sun, easy to spot in all their glory, but many more tucked into the bramble or hidden in overgrown patches that were likely once tended gardens. And I have noticed in the few years that we have been here that some years these old trees have born oodles of fruit. Untended as they have been and in need of some care, the apples do not always reach full maturity in those years, and they drop to the ground. They make excellent apple sauce. But we have hopes of bringing them back to better health. Other years, this past year being one of them, the tree that had dropped bushels of apples to the ground the year, before produced no apples. Strange. We have been planting more, adding peach, plum, and pear trees, as well as more heritage apple trees to the mix. When I get my head out of my veil, so to speak, I have noticed something different this year, early in the spring as it is. The backyard is teeming with bees. And I am not even talking about the four honeybee hives we have here right now. I talking about the big ones. Bumblebees. It seems we have had some kind of bumblebee hatch. Bumblebee bounty. Bumblebee abundance explosion. Bumblebee Baby Boomers? I don't know. We just have a lot of bumblebees here. And these bumblebees seem to be bees of unusual sizes at that. * Thank you Chicken Cheeks for the scientific nomenclature. I first encountered these members of the bees genus, bumbus, when Julia and I were replacing a few of our fruit trees that had not made it through the winter, down in the edge of the blackberry bramble. Hidden in the bramble are crabapple trees, an ancient apple tree, perennial flowering plants, patches of flowers from bulbs. It's wild down there, and likely was a tended garden at one point. She and I watched for a good while how they worked a flower. 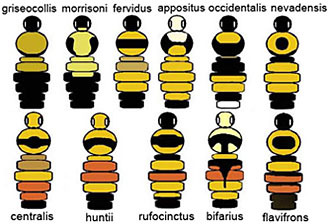 How their movements were different from the movements of a honeybee. How the shapes of the flowers they forage from differ from the flowers our honeybees seem to prefer. At the risk of sounding a bit like I am working on a 5th grade science project here, all these bird-like-bees have gotten me a bit curious about the different types of pollinators in Maine. I think, based on my amateur research, these bees are Common Eastern Bumblebees. Which was slightly less exciting than if they had turned out to be, say, a Lemon Cuckoo Bumblebee (bombus citronus), or a Confusing Bumblebee (bombus perplexus), or, I shudder to think of its influence on the children, an Indiscriminate Cuckoo Bumblebee (bumbus insularis). Yet this research is fascinating to me. And helping us to learn how to understand and see differences we would not otherwise have noticed. The other thing that lives down there in the bramble is a groundhog (or seven) and his intricate system of burrows and tunnels. Which makes me think that maybe there is a reason the bumblebee explosion seems to be centered in this area. I have learned that bumblebees tend to make their nests in the abandonned holes and burrows of other small creatures. And following my choose one spot and watch method, I was rewarded. I am beginning to better understand the low and slow circling, seemingly lost but apparently searching behavior we see sometimes. Our blueberry plants flowered this week. There is much to learn about the differing role and efficiency of native pollinators, such as the bumblebee, and nonnative pollinators, such as the honeybee. And the challenges faced by farmers of Maine's blueberry crop which is becoming increasingly dependent upon the use of commercial migratory honeybees, as Maine's native pollinator's abundance and diversity has declined due to habitat loss and use of pesticides and other environmental changes. And I am watching, hoping, that our bees, both native and tended, do their work on them. I can't help but notice the similar shape of the blueberry flowers to the flowers down in the bramble where we first began noticing the bumblebee abundance. That kind of makes sense to me now. So I've got a bit of a handle on the honeybee. And a rudimentary understanding of bumblebees. And all this research is making me, making all of us, want to learn more so we can do more to help these native creatures already here continue to do well here. Continue to stay here. And there are also so many other pollinators out there. I am on it. I will figure this one out. But first, let me watch this bumblebee search for a new home in our fruit patch. The old heritage trees and plants mixed with the new ones we introduce. The tended and the wild. The planted, the forgotten and the found. The honeybees we have brought here and the native pollinators that are also thriving here. It's a wild bumbus rumpus out there. And one worth learning more about.